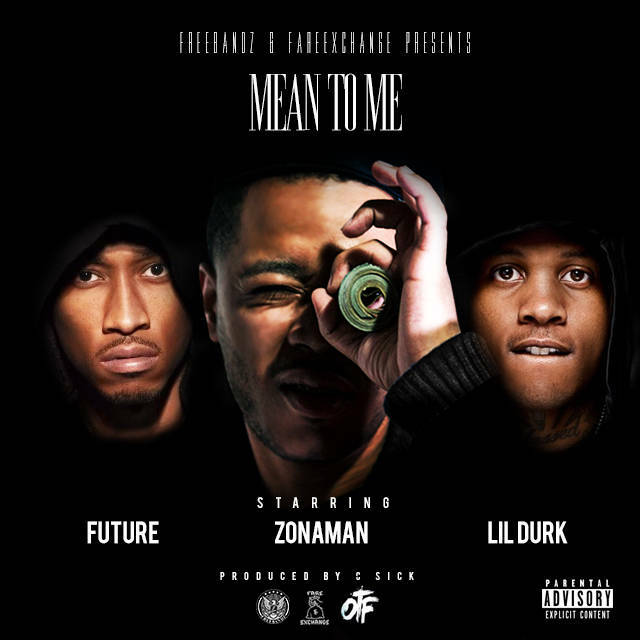 Home / New Music / Freebandz signee @zonaman72 links up @1future and @LilDurk_ for 'Mean to Me"
Freebandz signee @zonaman72 links up @1future and @LilDurk_ for 'Mean to Me"
The latest Freebandz Gang signee Zona Man linked up with Future and Lil Durk for his first FBG song “Mean to Me”. TheC-Stick produced track was actually made in Zona Man’s East Chicago living room when Future came to town for the Jungle Tour. The track also features Lil Durk who is coming off the release of his debut album Remember My Name. After premiering the track with The FADER, Zona explained that “Future came up with this crazy vibe for the song and just started recording in the middle of the living room with us. We thought it would be dope to put the youngest in charge Lil Durk with the wave he has at right now on the record as well.” It’ll be interesting to see what’s next for the FBG signee. In the meantime, stream the track below and let us know what you think.